With Herman Cain suspending his campaign yesterday due to baseless allegations and lies on his character, we had just witnessed the death of America. I say that because it was the media and the establishment, folks like Karl Rove, Charles Krauthammer, Bill O’Reilly, Keith Olbermann, Al Sharpton, and Tavis Smiley among others, who had torn down a decent man by listening to the allegations of “women” (and I use that term loosely) like Sharon Bialek and Ginger White who claimed that Herman Cain either sexually harassed or had an affair with them. IF the media were to have done their research on these “ladies” they would have found their claims to be baseless. Another thing that has me upset about this is the fact that the media had focused on these “allegations” because of the time frame in which they had taken place in. It seems odd to me that ALL of these allegations took place during Herman’s three years as head of the National Restaurant Association. Out of 45 PLUS years of business experience that Herman Cain has, working at the Department of the Navy, Godfather’s Pizza, Coca Cola, Pillsbury, the Federal Reserve bank of Kansas City, and Cox Media, the Blamestream Media decided to focus on those 3 years like a laser. If they really did their homework, they would have looked at the ENTIRE body of work and asked people who worked with him there and asked if he was like that. But the media did not because they wanted to choose our candidate for us. 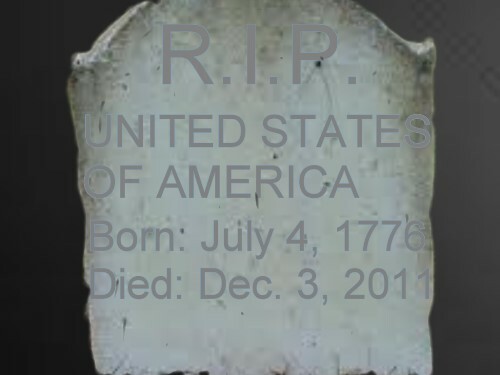 Well I hope the media is happy because now we are stuck with 4 more years of Obama and as such America died yesterday. Sadly, I think you are correct on all fronts. But, we can send a message by voting for Herman Cain in the early primary states. Iowa is a caucus and he should be on the ballots of FL an SC. That is the best way I can see of letting our voices be heard and keeping his vision for America alive. Rick, I hope you are wrong about 4 more years of Obama. That is what the media wants and the Republican establishment secretly would prefer Obama over Cain, because they are not much different from the Democrat and media establishment. Thanks for directing me here; great blog! I have also been wondering why credence was given to THREE YEAR out of a 45 year business career when the rest has been exemplary. Perhaps he was possessed? In any event, I like your blog and will continue to follow it.